[via sciencedaily] Two terrestrial planets orbiting a mature sun-like star some 300 light-years from Earth recently suffered a violent collision, astronomers at UCLA, Tennessee State University and the California Institute of Technology will report in a December issue of the Astrophysical Journal. Zuckerman, Henry and Michael Muno, an astronomer at Caltech at the time of the research, were studying a star known as BD+20 307, which is surrounded by a shocking 1 million times more dust than is orbiting our sun. The star is located in the constellation Aries. The astronomers gathered X-ray data using the orbiting Chandra X-ray Observatory and brightness data from one of TSU's automated telescopes in southern Arizona, hoping to measure the age of the star. Those expectations were shown to be premature, however, when Carnegie Institution of Washington astronomer Alycia Weinberger announced in the May 20, 2008, issue of the Astrophysical Journal that BD+20 307 is actually a close binary star — two stars orbiting around their common center of mass. Zuckerman and colleagues first reported in the journal Nature in July 2005 that BD+20 307, then still thought to be a single star, was surrounded by more warm orbiting dust than any other sun-like star known to astronomers. The dust is orbiting the binary system very closely, where Earth-like planets are most likely to be and where dust typically cannot survive long. Small dust particles get pushed away by stellar radiation, while larger pieces get reduced to dust in collisions within the disk and are then whisked away. Thus, the dust-forming collision near BD+20 307 must have taken place rather recently, probably within the past few hundred thousand years and perhaps much more recently, the astronomers said. "There is no question, however," Zuckerman said, "that major collisions have occurred in our solar system's past. 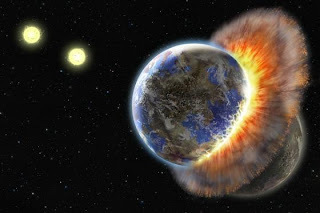 Many astronomers believe our moon was formed from the grazing collision of two planetary embryos — the young Earth and a body about the size of Mars — a crash that created tremendous debris, some of which condensed to form the moon and some of which went into orbit around the young sun. By contrast with the massive crash in the BD+20 307 system, the collision of an asteroid with Earth 65 million years ago, the most favored explanation for the final demise of the dinosaurs, was a mere pipsqueak." In their 1932 novel "When Worlds Collide," science fiction writers Philip Wylie and Edwin Balmer envisioned the destruction of Earth by a collision with a planet of a passing star. The 1951 classic movie based on the novel began a long line of adventure stories of space rocks apocalyptically plowing into Earth.